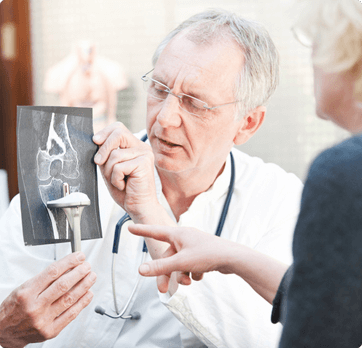 At Associates in Orthopedics in Punta Gorda, Florida, our doctors have many years of experience providing leading-edge treatments and performing advanced procedures. They focus on the latest minimally-invasive, state-of-the-art surgical and non-surgical procedures, providing exceptional care for people of all ages and athletic abilities. To schedule an appointment with Dr. Baker, Dr. Braut, Dr. Hansell, or Dr. Schroering, call our office at (941) 637-BONE (2663) or request an appointment online. Dr. Steven Baker attended Tulane University in New Orleans, Louisiana, where he received both his undergraduate and medical degree. He completed his internship at St. Luke’s Hospital in Kansas City, Missouri and his residency in orthopedics at the University of Missouri Kansas City School of Medicine. Following his residency in 1983, Dr. Baker moved to Florida and has been a member of the Punta Gorda and Port Charlotte community ever since. In 1988, he was Chief of Staff at St. Joseph Hospital in Port Charlotte, and in 1992 and 1993, he served as chief of staff for Charlotte Regional Medical Center. Dr. Baker is a member of the Florida Medical Association and the Charlotte County Medical Society. He is also a former board member of the Charlotte County Indigent Care Committee. Dr. John Braut received his bachelor of science in biology at the University of South Carolina. During his years at USC, he was active in cancer research, as well as attending events to support the Gamecocks sports teams. After completing his degree, Dr. Braut moved to Hilton Head Island, South Carolina. Originally from the Philadelphia area, Dr. Braut then moved back home to Philadelphia to attend Philadelphia College of Osteopathic Medicine in 2004. After receiving his doctorate of osteopathy degree, he began an internship and residency in orthopedic surgery at the University of Medicine and Dentistry of New Jersey. He then went on to complete an AOTrauma fellowship in Fribourg, Switzerland. Dr. Braut has been practicing orthopedic surgery in Punta Gorda and Port Charlotte since 2013. He practices general orthopedics with an emphasis on fracture care, arthritis treatment, joint replacement, shoulder and rotator cuff surgery, carpal tunnel surgery, knee and meniscus surgery, stem cell surgery, and arthroscopic surgery. Dr. Braut is certified to perform robot assisted partial knee replacement and total hip replacement utilizing the MAKO robotic assisted arm. He also serves on the hip fracture committee at Fawcett Memorial Hospital, which works to improve outcomes for patients who have sustained a hip fracture. Dr. Braut believes in carefully listening to you about your ailments and how they are affecting your life. He explains the diagnosis in an easy-to-understand manner. He will develop a treatment plan for which to ease pain and improve quality of life and ensure you understand your options. His initial plan involves nonsurgical treatments to avoid surgery. However, if conservative treatments fail and surgery is necessary, he personally explains as much information as possible to guide you through the process and ease concerns. Dr. Braut and his highly trained staff work to improve quality of life and get you back on the field, course, or court utilizing the latest treatments and technologies in the least invasive way possible. Dr. Robert Hansell received his undergraduate education at the University of California at Santa Barbara, where he majored in biology and environmental studies. He then attended the California College of Podiatric Medicine in San Francisco, where he received his doctor of podiatric medicine (DPM) degree in 1978. Several years later, Dr. Hansell went back to medical school and received his medical degree from George Washington University in Washington, DC in 1989. He completed his internship and orthopedic residency at the Medical College of Virginia in Richmond, where he served as chief resident. Dr. Hansell also completed a fellowship in orthopedic spine surgery at the University of Southern California, Los Angeles. Following his fellowship in 1995, Dr. Hansell moved to Florida and joined an orthopedic practice in Port Charlotte, where he met Dr. Baker. In 2003, the two of them began practicing together at Associates in Orthopedics, PA.
Dr. Hansell is board certified by the American Board of Orthopaedic Surgery. He is a member of the American Academy of Orthopedic Surgeons, the American Medical association, and the Charlotte County Medical Society. Dr. Steven P. Schroering is a graduate of the University of Louisville Medical School. He is a board-certified orthopedic surgeon and a Fellow of the American Academy of Orthopedic Surgeons. Dr. Schroering practices general orthopedics including: fracture care, adult reconstructive joint surgery, hand surgery, foot and ankle surgery, arthroscopic surgery, pediatric orthopedics and trauma surgery. Dr. Schroering first practiced medicine in Moreno Valley, California until 1996, after which he practiced in Southwest Virginia until 1999. He then relocated his practice to his home state of Kentucky, where he continued to practice general orthopedics until 2004. Searching for a warmer climate, Dr. Schroering relocated to Lehigh Acres, Florida in November of 2004 and then to Punta Gorda, Florida in April of 2011, joining Associates in Orthopedics. Dr. Schroering has served many leadership positions, including member of the board of directors for Lehigh Regional Medical Center; he has served as chief of staff, chief of surgery, Credential Committee chairman, chairman of the By-Laws Committee, chairman of the Medical Ethics Committee, and Peer Review Committee member. Dr. Schroering has volunteered for many humanitarian and philanthropic organizations, mostly related to medicine. This includes the China America Medical Project, California Children Services for the care of children with cerebral palsy and muscular dystrophy, World Harvest Missions and its' orphanage, and New Life Children's Home in Port au Prince, Haiti. Dr. Schroering is one of the founders of Lee County Volunteers in Medicine and is chairman of the board, providing free healthcare to the uninsured, underinsured, and the working poor.